This entry in our “What We’re Reading” series might better be called “What We’re Reeling,” as my recent choice of tomes has triggered a level of cognitive imbalance in this reader’s brain. The New Jim Crow: Mass Incarceration in the Age of Colorblindness by Michelle Alexander, an Associate Professor of Law at Ohio State University and civil rights advocate, received much critical praise when it was released in 2010 and has spent 133 weeks on the New York Times’ Bestseller List. Using the War on Drugs as a focal point, the book lays out an argument that the election of our first African-American President did not usher in a new era of colorblindness; that we are instead living in a time where racial caste in America has not ended, but merely been redesigned. 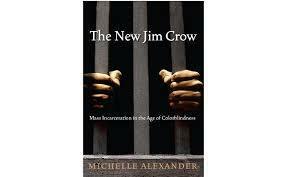 The New Jim Crow is not a book that I would normally gravitate toward for a leisurely read. Had I not been invited to participate in an event celebrating Black History Month at the Druid Heights Community Development Corporation in Baltimore, I likely would never have read this book. The event will be held on March 18, 2017 and is supported by the Maryland Humanities Council. It seeks to gather a diverse intergenerational audience and, using the book as a vehicle to spur conversation, create a platform for learning about racial inequality in our communities. I can see why this book was selected as that vehicle. In the book, Alexander provides a powerful and compelling argument that the War on Drugs has succeeded as a policy of relegating millions of mainly low-income people of color to the status of a second-class citizen. And this caste system, due to structural policies, is not one a person may transcend. The author argues this new dynamic is actually not new at all; just a repackaged and linguistically-nuanced version of the old Jim Crow laws. While many would believe that Jim Crow died with the passage of the Civil Rights Act in 1964, Alexander argues that federal drug policy and the drug wars that federal, state and local law agencies have been engaging in since the early 1980s, have given rise to a new Jim Crow. This new Jim Crow, cloaked in the name of law and order, denies those convicted of even the most minor of felonies the right to vote, serve on juries, access housing, receive an education, or qualify for public benefits; all realities that applied to people of color under the old Jim Crow. While there was much to Alexander’s argument that I was aware of, the depth of the structural foundations and its applications were sobering and humbling to say the least. In my role as Grants Manager, I review hundreds of letters of inquiry each year, with the majority of them from human service organizations – many of them working with the populations this book discusses. I knew the road ahead for these individuals was not easy; however, in reading this book, I realize my own naivety about the difficulty of that road. Much has been written in defense of (and in opposition to) Alexander’s argument. Regardless of where one comes down, I feel confident in saying that for me, the book emphasized the importance of avoiding binary thinking when it comes to racial inequality and many other issues confronting society today. It also emphasized the importance of humility, grace, and the need for civil discourse if we are to change a system for the better.